As a child, our family never passed the Wheel Inn without stopping to eat. 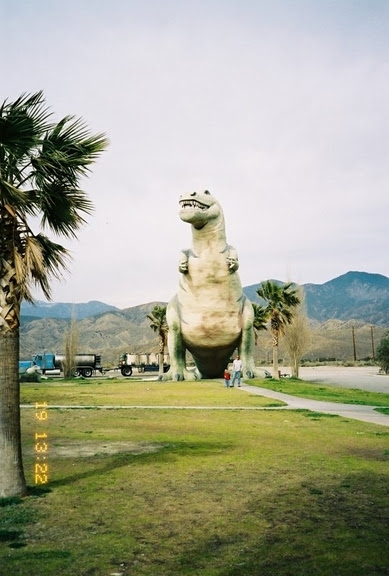 We were not far from Cabazon and had to pass it on trips to Palm Springs or on vacations heading east on Interstate 10. In 1958, Claude K Bell opened his restaurant. 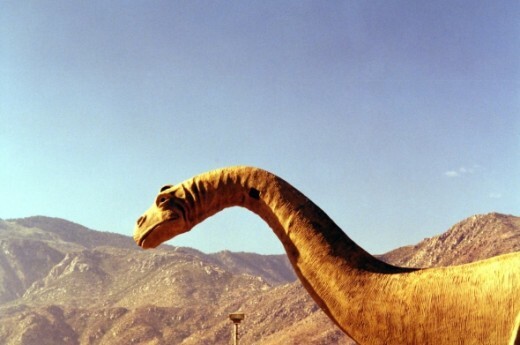 He started the brontosaurus in 1964 to draw in more business. 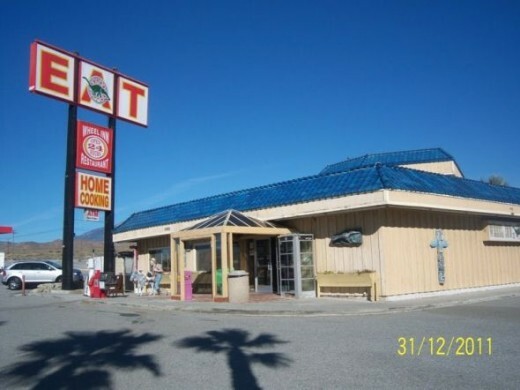 When I had kids and we headed east on the 10 freeway, we also stopped at the Wheel Inn. Now that I am raising my grandson, we still stop at the Wheel Inn. It's just one of those things that families do as a tradition. 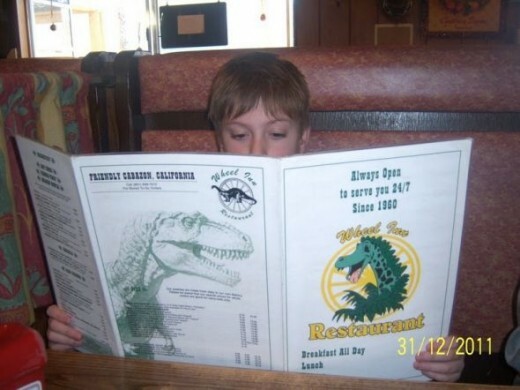 You used to be able to eat at the Wheel Inn or feed your child to the dinosaur. Both choices were available. See Major Bummer below. The Wheel Inn is closed. The photos are mine and taken between 1995 and 2011. We went to Laughlin, Nevada in July 2014. We had heard that the Wheel Inn was closed but had to see for ourselves. It was so sad. The dinosaurs were still there and the gift shop still open but we didn't get our favorite breakfast. Somehow, eating at the Denney's is just not worth it. Hopefully, someone with money will come along and reopen the restaurant. It is for sale. Until then, we may stop for pictures because we always have but it has lost some of its magic. 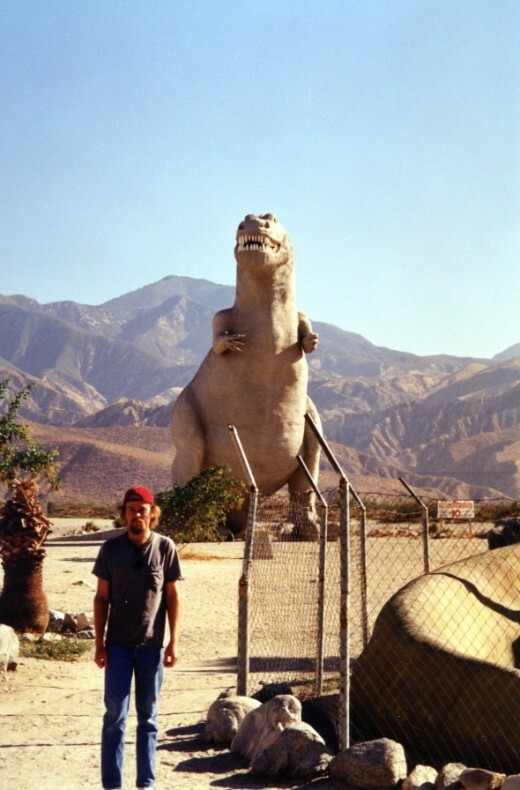 Cabazon in 1994 - The model is my son Scott at age 25. 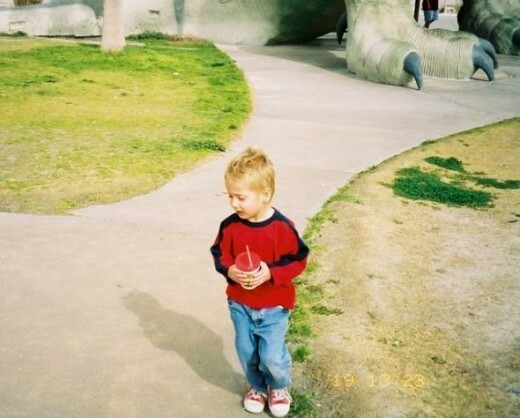 He's a lot older now! Who is Claude K Bell? He was much more than just a dinosaur builder. The story is told that he went to South Atlantic City as a boy and was very impressed by a gigantic elephant named Lucy. It was actually a building shaped like an elephant. That is apparently what sparked his interest in sculpting and led him to create statuary for Knott's Berry Farm and Calico Ghost Town. When he opened the Wheel Inn in Cabazon, it gave him the opportunity to create the giant sculptures he fell in love with as a boy. Here is the opportunity to meet Diney and Mr. Rex. 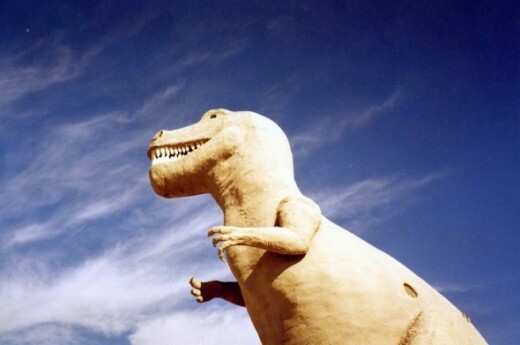 Diney (Dine-y) is 150-feet-long and Mr. Rex is 65-feet-tall. There is a gift shop inside Diney but the building inside Mr. Rex has never been open to the public. Before his death in 1988 at the age of 91, Mr. Bell had plans to add a saber-tooth tiger and a giant woolly mammoth. Both of them actually inhabited the area. 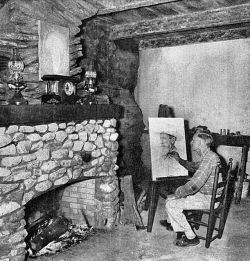 Claude Bell in his new "Artist's Studio" at Knott's Berry Farm, drawing Ed Strouse, Feb. 1954. "Photo courtesy Orange County Archives"
Photo from the Los Angeles Times archives. 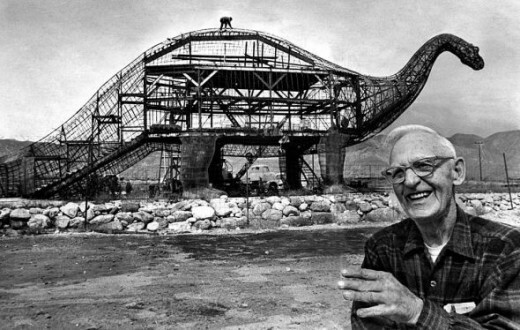 March 23, 1970: Sculptor Claude K. Bell with his 45-foot- tall, 150-foot-long brontosaur in Cabazon next to Interstate 10. Bell, a Knott's Berry Farm sculptor and portrait artist, opened the Wheel Inn cafe in 1958. To attract customers, he began building dinosaurs. 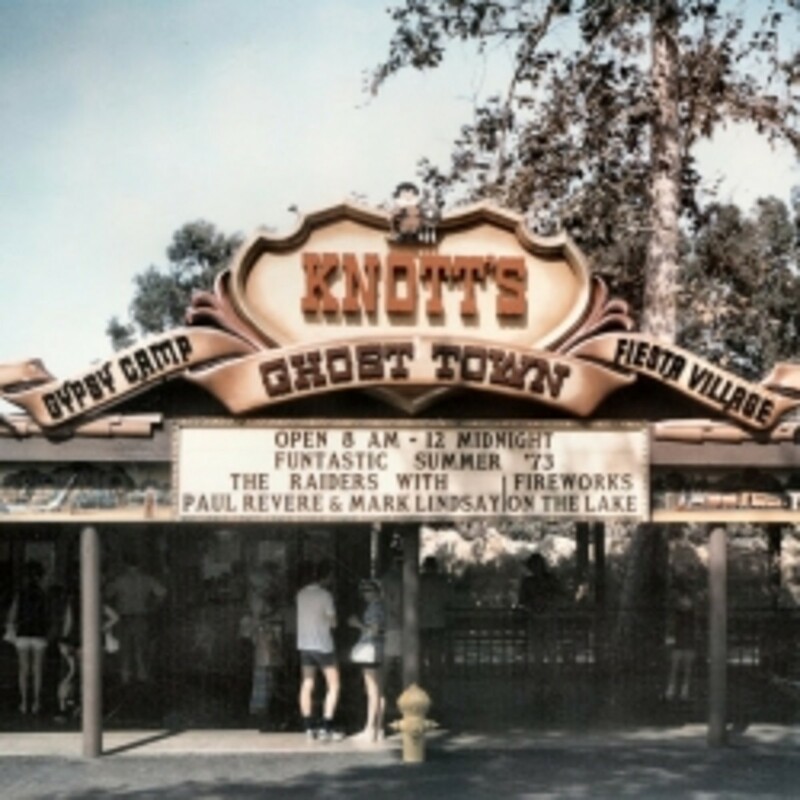 What does Claude K Bell have to do with Knott's Berry Farm and Calico Ghost Town? Learned something new! 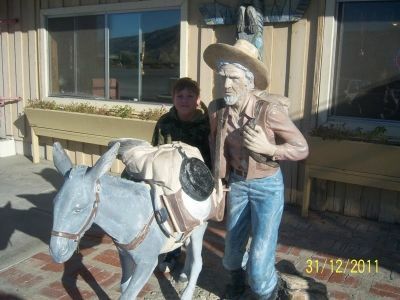 Check out this link and look at the pictures of the similarities between the Knott's Berry Farm statues and those at Calico Ghost Town and the Wheel Inn. This blog is full of great information. 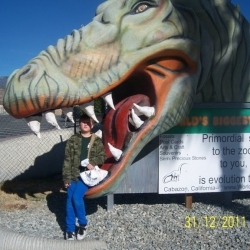 Dinosaurs in Cabazon, California. A Fine-art Photographic Print by Carol M. Highsmith. 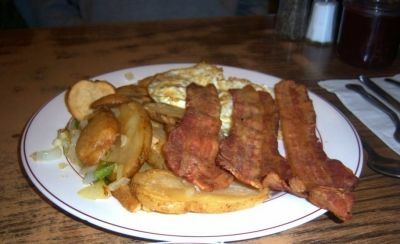 Who's eating breakfast at the Wheel Inn? There is a theme here. When we park at the Wheel Inn, we always make sure that we get the dinosaur in the picture. The teardrop and the 1959 Dalton look good with Mr. Rex. The Wheel Inn was only a year old when the trailer was built. Amazon does not sell my favorite poster of the dinosaurs on the 10 freeway eating the cars that go by. Many children have already given that scenario some thought. 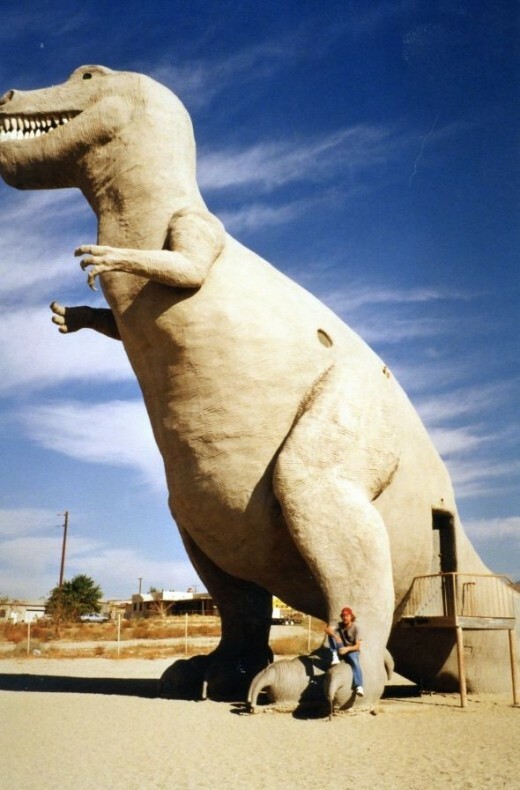 In the old days, once you passed Banning, heading east on Hwy 10, the dinosaurs seem to rise out of the desert. Children were often startled to see them. Now, if you can get by the The Cabazon Outlet Mall and the Desert Hills Premium Outlets, you're almost there. You'll pass Hadley's where you might want to stop for a date shake but you still can't see the dinosaurs. The Morongo Casino, Resort & Spa is the new sight. It's hard to miss. But don't despair, the dinosaurs are just past the Casino. We wanted something different for breakfast. The Wheel Inn is 30 minutes from us so we headed out to visit the dinosaurs and enjoy our breakfast surrounded by mountains. It's not just Pee Wee Herman who has made the dinosaurs famous. People come from all over the world to see them. They are featured in music videos. FYI - It is always windy in Cabazon. It's either windy or gale-force winds. There is no in-between. Just down the road, before Hwy 111 heads into Palm Springs, the wind farms began. Those are the big wind turbines that create electricity which also can be seen in the Brad Paisley video. Brad Paisley - Welcome to the future - Dinosaurs and wind turbines make it into this video. 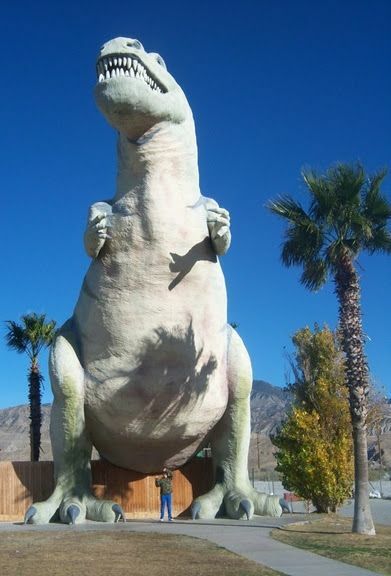 The world famous larger than life concrete Cabazon Dinosaurs Mr. Rex and Ms. Dinny are both open for visitors. 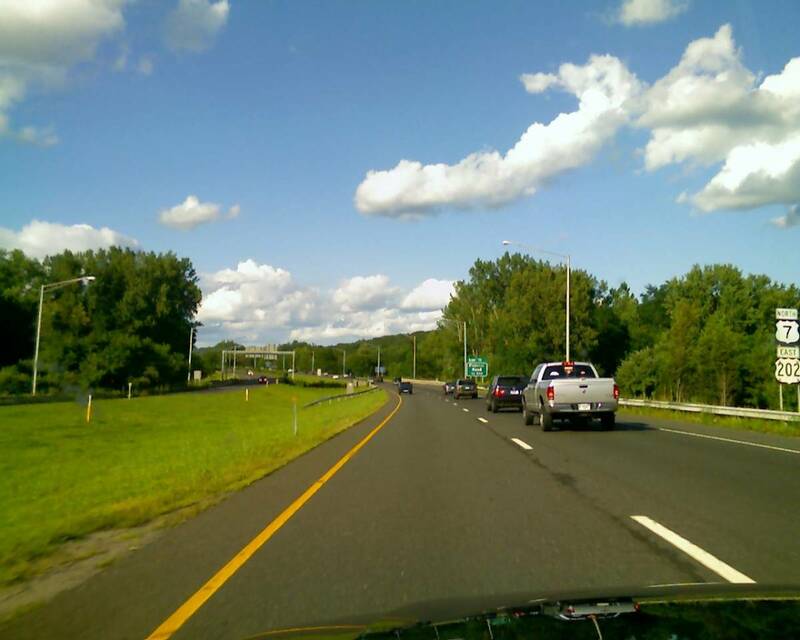 More editorial comments on how the area has been "has been severely compromised. (by) Allowing the construction of a garish Burger King"
SOMEONE PLEASE BUY THE WHEEL INN AND REOPEN THE RESTAURANT! Have you been to see the Dinosaurs? That is so cool. Haven't been to Wheel Inn, but there is a place 'round these parts named Dinosaur World. Can you guess what they have? I think your life is one fun adventure after another...and you take us along for the ride! The Wheel Inn sounds like a great place to eat! I love the dinosaurs! I love family traditions like this. The photos are awesome. I've never been there but I'm sure my husband would know about it. CCGAL's comment about working there is pretty cool. I have never heard of this place, but would certainly want to stop there if I was ever out that way! 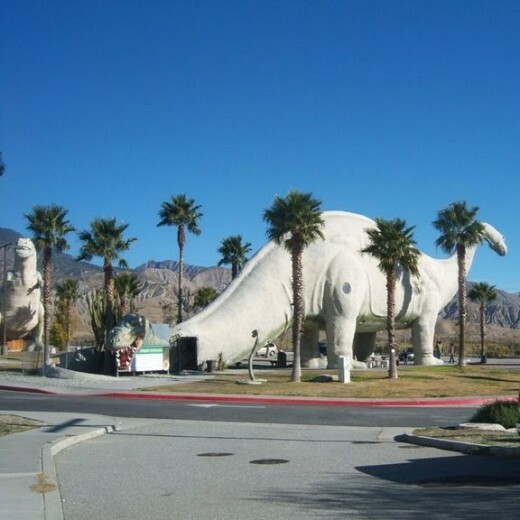 No, I haven't had the opportunity, but I love the fact that your family has made a tradition of stopping there to see the Cabazon dinosaurs. I haven't been there but that breakfast looks delicious! 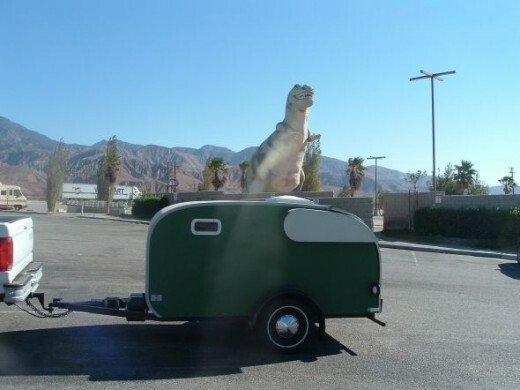 Love the photo of the green trailer with the dinosaur! 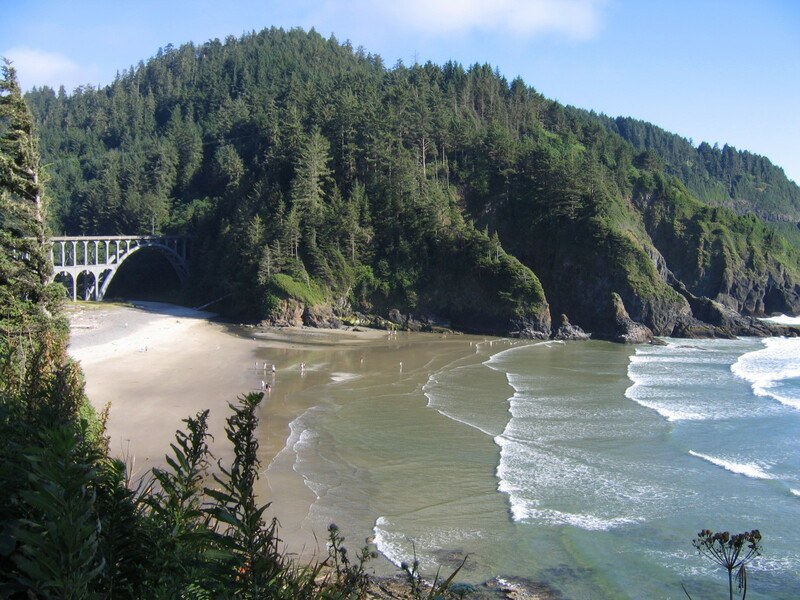 Never been there, but enjoyed my virtual tour to there! Sounds very interesting - and a fun photo op! I'd love to visit the Wheel Inn! Blessed! 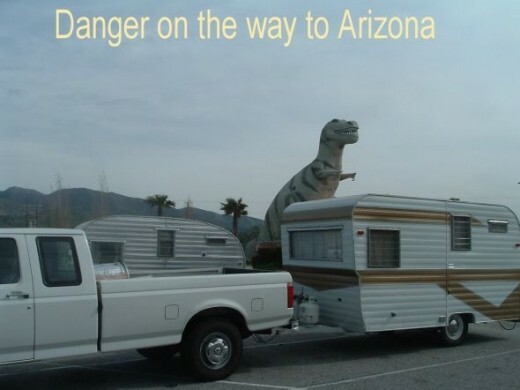 I love the photos of the dinosaur menacing your camper. You have a fun outlook on things. I was so happy to see this lens, you have no idea! I worked for Mr. Bell in 1976 in the dinosaur when there was nothing there but Dinny and the Wheel Inn. We lived in one of Mr. Bell's houses (no longer there) and worked in the Gift Shop. I have the dubious distinction of having crawled up into the head of the Brontosaurus to change the lightbulb. Mr. Bell gave me tips about drawing - I have a pencil drawing I did that he showed me some tricks on. He was a really interesting man, and I am glad I knew him for that short time. RIP Claude K. Bell. We stopped at the Wheel Inn for the first time as we passed through Cabazon on our way to Arizona. We had a couple burgers for lunch - quite good. The restaurant definitely had that "old time" cafe atmosphere. They also have a small gift shop off to the side near the register - bought a couple postcards. Of course we visited the dinosaurs (had been there once before) - managed to see them just before the storms moved through, so didn't get wet. The only disappointment was that the dime "squisher" was out of order (only dime squishing machine I've ever seen).